It is so very hard to believe "again" that I have not done an update on our family for so long. So much has continued to happened in our lives but that is the course of life. There have been many trials and many triumphs and the Lord has continued to bless our family and to take care of each and every one of us in miraculous ways. Here is our latest updates on our incredible crew who are also our closest friends! Their isn't anyone we would rather spend our time with than our children and our grandchildren. The saying that says that "grandchildren are a parents reward" is so...........very, very true! We have (9) rewards and they are indeed......"Precious in His sight"! Our children and grandchildren are the light of our lives and the fruit of our years together that has multiplied over the years. For them...we are thankful. Our number two son, Matthew (35) and his wife, Carrie & co. moved to Mankato, MN fall of 2018 back to my mid-west roots. Their crew includes Isaac (12) and enjoys sports and is involved in swimming and soccer or hanging with his friends. Rachel (10) the princess of her family. You will always find her in some type of dress or dress-up outfit dancing and singing wherever she goes. Caleb (8) is "the little" brother and the spitting image "literally" of his dad! Kinda amazing such a little fella can look so much like dad at that age. He like his older brother loves sports and is involved in soccer and basketball. 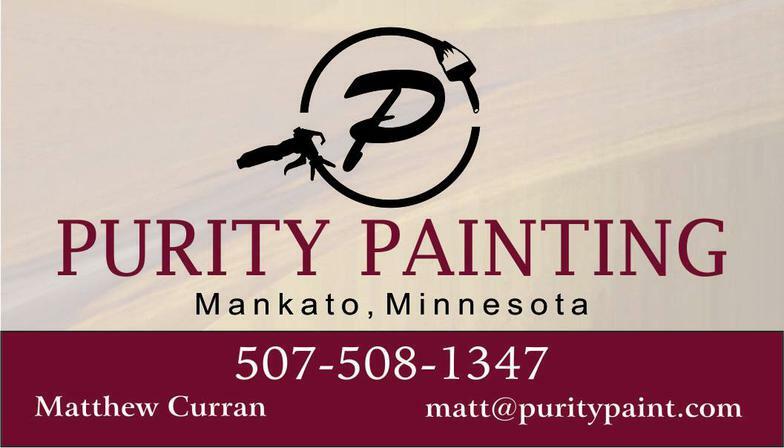 Matthew has Purity Painting and is also an amazing musician. Carrie works at the YMCA and is a brother/sister program advocate. She has great ambition in several areas of life and does them with great passion. Our #3 son Samuel & his wife Emily's family include two rambunctious boys, Liam (9) & Eoin (6). Sam has also been blessed with a very prosperous business, Elk Ridge Contracting, which has allowed his wife Emily, to fulfill her dream of being an at-home mom taking care of & homeschooling the boys. His passion for hunting season and the Green Bay Packers is a big part of their family life! Emily is a very creative lady and an amazing pianist and vocalist. 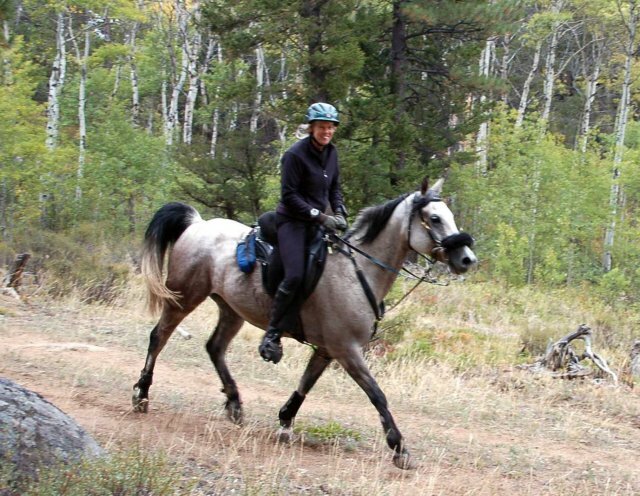 She has a beautiful Morgan gelding Paladin that is her next project to train this spring. 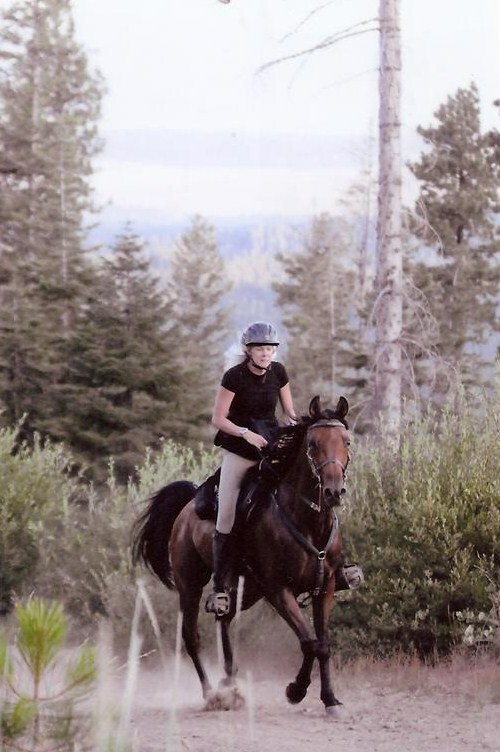 They hope to use him for hunting and she would like to compete on him in endurance one day. Liam is growing up fast and loves to read and is involved in basketball and baseball. Eoin loves puzzles, games and is always engaging one of us in go fish, battleship or stratego! We share a 7 bedroom home with Sam, Emily & the kids with each one of us having a side of the house. It is always full of folks, family, poos and lots of love and fun!! They are in the process of finishing their new home that Sam's crew has been working on and plan to move in this spring. "Lord help me to be the person my dog thinks I am." Last but not least, this is what Steve and I have been doing!! This year was busy with our precious poodles and sharing them with many of you that are reading this letter. They are such a gift in our lives and it is a privilege to play a part in bringing a new family member to those of you around the country and abroad. We thank each and every one of you that chose Shiloh Garden Standards for your standard poodle. With each puppy that leaves our home, you are getting a part of us and we feel that we are giving you the greater gift. They continue to bring us much joy and we are so thankful to live the lifestyle that we do here on the ranch, that enables us to raise this magnificent breed! Our children and our grandchildren however, remain our greatest treasures on this earth! Without us, they would not be and without them, who would we be? We have 9 beautiful and talented grandchildren that make life complete. They are our life, our joy and we are so thankful for each and every one of them. Their is not one person we would rather spend our time with than our family! Steve & I will celebrate 34th years of wedded bliss this July 2019! !!! Very thankful for a Godly man by my side like Steve to share life's journey with. Steve is still working for FedEx which brings long days on the road by the time he gets home. 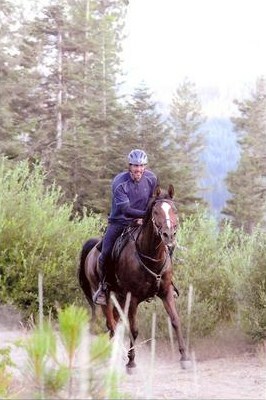 He is no longer competing in endurance with me, but hoping one day he will be back in the saddle again. He loves to play golf in the summer every chance he can get. 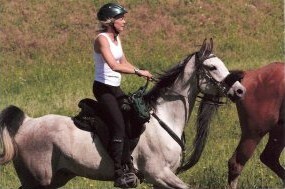 Then there's me......I was born to ride, and to ride hard, ride fast and ride very...........far. 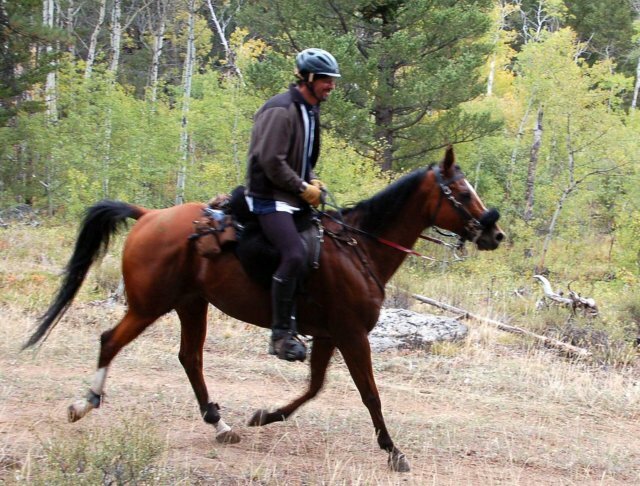 They say a woman's place is in the kitchen, well..............I would dispute that to say, " a woman's place is in the saddle in the mountains or wherever their four hooves take you!" My earnest passion of the Arabian breed will always stir my soul as long as I can walk, talk and think straight! After a 6 year hiatus from endurance competition, I hope to be back at it here in 2019!!! Life's challenges and a few broken bones have kept me from competing but definitely not riding. 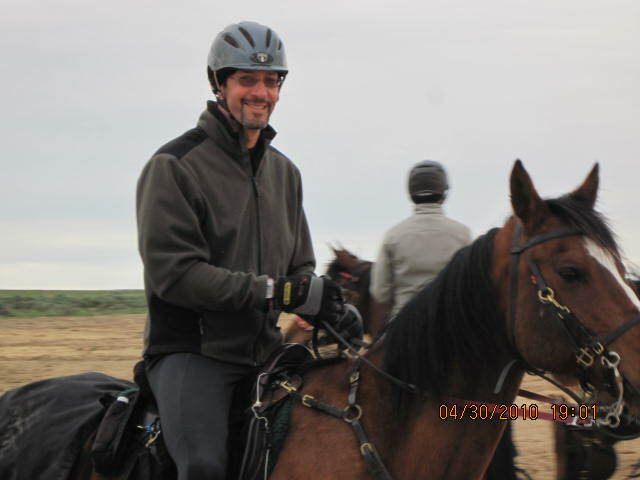 I have two wonderful geldings that I'm riding, with my newest upcoming guy Valor who I'm super excited about. Shylea .....who is our baby girl at (27) got married to the love of her life and an absolutely amazing man October 2014. It is truly a blessing for her and Alana to have Braden in their life and to continue on with "Alana's Story"! Braden works for State Farm Insurance and is doing very well in the business. He is an awesome dad to Alana and the perfect addition to the Euker Family. Shylea is busy being a momma to 2 girls, running Alana to therapies, homeschooling both of them and working a few evenings a week at a Brewery/Restaurant. Alana's (10) story is long....but the nutshell version is..... she started with seizures at 1 years of age, of which escalated to massive proportions continually over which time we tried every possible drug and alternative known & possible for her. September 2013 was her first surgery in which she had an abnormality removed as well as her right temporal lobe removed. Our hope was that she would not have another seizure, however, after 3 months, they started again and reached out of control again in October/November. December 2, 2014 Alana had a Corpus Callosotomy which is where the two hemispheres are separated. As of December 2nd, 2018 Alana has been seizure free for 4 years. Emberlyn joined the family April of 2016 and is a spunky, spitfire and brings pure joy/frustration to her family!! Our oldest son, Brandon (39) and his family live in Oregon and are both done with their service to the United States Military. Their travels have included several different states and two tours of duty to Iraq. Brandon and his wife Lacey are continuing their education since leaving the military. Their passion is traveling in their VW Bus and camping with the kids! Together Brandon and Lacey have two of our beloved grandchildren, Chance and Kylan. Chance is 17 and has a passion for playing soccer and has many incredible goals for his future. Kylan, 15, is talented at the flute and loves to take pictures and draw. She is quite an amazing little artist. I hope you enjoyed seeing our family and who they are!